What an awesome weekend of Irish victories and momentum with the Ladies taking England apart in the greatest yet performance, the U20s played it perfectly beating England with a Scholes try and the Clubs win through a Ballynahinch / Stuart Morrow try! The weekend started on Friday night with the Ireland U20s team facing England in what is undoubtedly the future of both national men's squads. The Ireland coaching team and strategy developers had completely analyzed the English play in previous games and the squad had a very simple game plan to nullify the one way that England play and that is with crash ball. Having absorbed everything and gone behind on the scoreline when the England team had become a spent force Ireland struck with the killer blow, a perfectly worked try on the wing which was duly converted. Ireland held the game at this level until the final whistle was sounded on a superb victory. On Saturday the Irish Rugby Ladies national side lined up against current Six Nations grand slam champions England who are also regularly ranked number 1 in the world and who brought a strengthened side to face Ireland Ladies. From the kick off Ireland dominated almost every series of play, scoring 25 points in the process before 60 minutes on the clock! England responded with very little and Ireland ladies very quickly focused on the future games. On Sunday with memories of the Six Nations game against England last year in which we were very close until a prop substitution exposed a weakness in the tight head position which England used well to defeat Ireland the team once again face England. This game was very different. The Irish Scrum was superb! The line out functioned perfectly and in open play the defense and attack was immense. In torrential rain Ireland did not get momentum but will be absolutely delighted with the scoreline as the memory of the corresponding fixture the previous year is made history. In what was a very very close game, Ireland emerged with the knowledge that we have what it takes to beat England. As a result the weekend was very much an Irish victory with 3 victories as opposed to England securing only one close game marred by torrential rain. 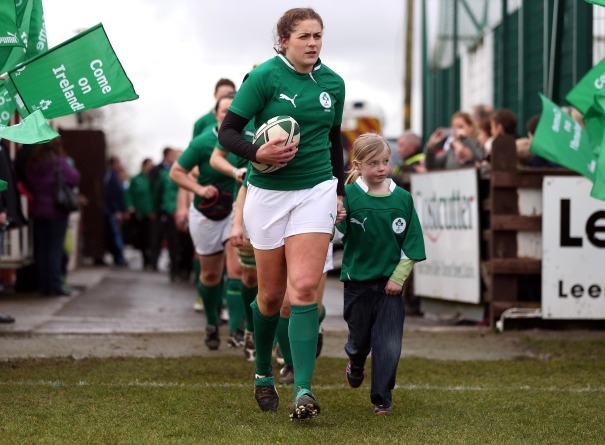 As the ladies sang "Stand Up For The Irish Women" the future of Irish Rugby is looking extremely positive!!! !